In 2017, the average quarterback rating dropped by 30.8 points when under pressure versus when they were kept clean in the pocket. While last season’s top pass-blocking units will look to continue giving their quarterback time to throw, the 2018 offseason left some with more questions than answers. Be it free agency departures, retirements or even trades, some of last year’s top offensive lines in the NFL will look quite a bit different in 2018. With that said, let’s look the teams who will try to build on their pass-blocking success in the upcoming season, with a new-look unit. After ranking fourth in team pass-blocking grades in 2017, the Browns strongest unit will have new names at the left and right tackle spots. 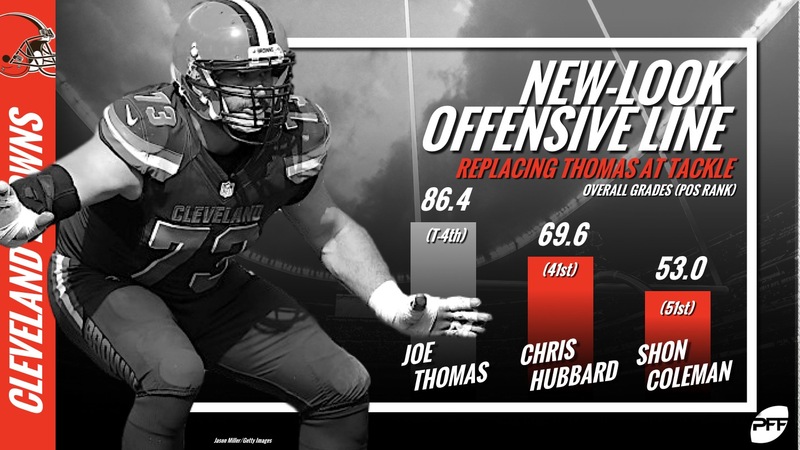 Joe Thomas announced his retirement this past March, leaving large shoes to fill as the future Hall of Famer posted an 88.8 pass-blocking grade over 331 pass-snaps during his final season. Their changeover found them ranked 14th in the league in our preseason offensive line rankings earlier this offseason. Whether it’s Tyrod Taylor or Baker Mayfield, it’ll be imperative the Browns have stability at both tackle spots. Shon Coleman (57.8 pass-blocking grade), who started 16 games at right tackle last season, is expected to take over for Thomas on the left side while Chris Hubbard (74.0 pass-block grade) steps in on the right. The Browns offensive line will have its hands full during their Week 4 matchup against a Chargers defense that ranked third in our preseason pass-rushing rankings released this week. There is arguably no better edge defender tandem than Joey Bosa and Melvin Ingram, who ranked first and fourth, respectively, in pass-rush grades at their position. It will be a tough challenge for Coleman and Hubbard, but they’ll need to stay sharp to keep the pocket clean. With a unit that finished 10th in team pass-blocking grades in 2017, replacing Ryan Jensen’s production at center will be critical for the Ravens. Jensen, who signed with the Tampa Bay Buccaneers, had a pass-blocking efficiency rating of 98.4, which tied him for seventh among all centers and led the Ravens. With Marshal Yanda returning to right guard, left guard and center will be under the spotlight. Matt Skura looks to replace Jensen at center, but is coming off a year where he registered a 45.6 pass-blocking grade while starting 12 games at right guard. Former fourth-round pick Alex Lewis is slotted in at left guard but will have much to prove after missing all of 2017 with a shoulder injury. The Ravens find themselves with question marks, and at No. 24 in our preseason offensive line rankings. The Bengals pass-rush will be a headache for teams all year long and the Ravens are getting an early dose during this Week 2 AFC North clash. The above-mentioned Atkins should put this restructured Ravens line to the test, after registering seven total pressures in two games between these teams in 2017. Yanda vs. Atkins will be must-see TV. In a season where the Bills ended a 17-year playoff drought, their offensive line stood out as a big reason for their success. The Bills line accumulated the second-best pass-blocking efficiency rating of any team in the league last year, but with the departure of Richie Incognito, Cordy Glenn and Eric Wood, repeating this will be no easy feat. Despite their experience, with pass-block grades of 71.3 and 64.4 last season, the loss of Glenn and Wood, respectively, pales in comparison to Incognito who graded as the 12th best pass-blocking lineman in the NFL. With Incognito out of the picture, the Bills look to eight-year veteran Vladimir Ducasse to step in at left guard while Russell Bodine and John Miller likely round out the interior line. The loss of the aforementioned trifecta is one of the biggest reasons the Bills find themselves ranked No. 29 in our preseason offensive line rankings. A Week 12 bout with 2018’s second ranked pass-rushing team will tell us a lot about how this Bills line has rounded into form. On the interior, they’ll have to keep Malik Jackson in check who’s coming off a season in which he generated 51 total pressures and tied for fifth in pass-rush productivity on the defensive interior. Even if the Bills can keep Jackson contained, they’ll still need to plan for the fearsome pass-rush that Calais Campbell, Marcell Dareus and Yannick Ngakoue could generate. This matchup should tell a lot about how they’ve performed this season, and could perform as a unit to end the season. 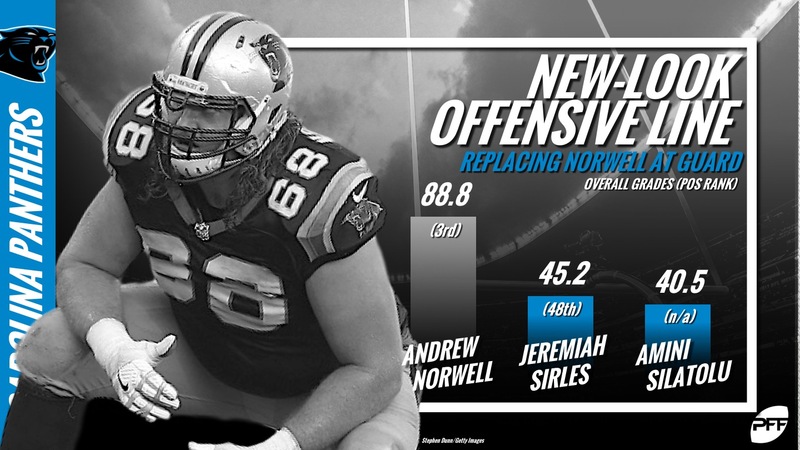 Andrew Norwell inking an offseason deal with the Jaguars marked the end of an impressive four-year tenure in Carolina. Cam Newton will surely miss the left guard, who yielded only 13 total pressures while not allowing a single sack or hit on the quarterback in 2017. The good news for the Panthers is their other four lineman spots will see familiar faces returning. The bad news is that they’ll need replace the highest-graded pass-blocking guard from a season ago. While they did not address guard in the draft, former Minnesota Vikings G Jeremiah Sirles will look to fill the massive void left by Norwell. However, this could be an uphill battle for the Panthers as Sirles’ 2017 pass-blocking grade of 45.2 is less than half of what Norwell posted. If not Sirles, then the Panthers may look to a variety of unproven players to fill the void in either Taylor Moton or Amini Silatolu. Norwell’s loss saw the Panthers fall from 10th in our season-end offensive line rankings to 21st in our preseason rankings. Geno Atkins and the Bengals’ top 10 ranked team pass-rush unit will give the Panthers an early indication of if their strategy to replace Norwell is going smoothly. Atkins has been terrorizing offensive lines throughout his career and 2017 was no different, finishing with an astonishing 70 total pressures. Atkins rushed the passer from the defensive right tackle spot more than any other position last season, which could spell trouble for the Panthers. After finishing 2017 as the ninth-highest graded pass-blocking team, the Chiefs look to continue their success in the trenches with their young signal-caller Patrick Mahomes taking over under center. However, despite a strong chance their Week 1 starting offensive line is the same from their opener a year ago, it may not bode well for the passing game. When current center Mitch Morse went down with an early injury last season, the Chiefs turned to backup Zach Fulton who ended up putting together a stellar year as a pass-blocker. Fulton, now with the Houston Texans, will be a big loss after posting an 87.5 pass-blocking grade ranking him second among all centers and first on the team. The Chiefs have their share of challenging matchups this season, but head coach Andy Reid will need to come prepared for their Week 11 showdown with our fourth-ranked pass-rushing unit that belongs to the Rams. As if Aaron Donald’s league-leading 99.9 pass-rush grade wasn’t enough to worry about, factor in newly-acquired Ndamukong Suh and this could lead to a long day for the Chiefs line, and go a long way at depicting just how good this offensive line could be in 2018.